I bump into Ymagis’ CEO Jean Mizrahi as we walk in opposite directions on Rue Eugene Colas that connects the centre of Deauville with the convention building on the beach. It was the first day of the annual French cinema conference and he looked rushed. “I may not be able to make our interview later today,” he apologised. I said that it was fine and I would re-schedule with his Director of Marketing and Communication. But a nagging suspicion was confirmed when I verified that the interview was not scheduled until the following day. Jean could be forgiven for being rushed, as he was probably the second busiest person at the conference after FNCF President Richard Patry. This year Ymagis was front and centre of almost everything that took place at the 72eme Congres de la Federation Nationale des Cinemas Francais (FNCF) roupathering in Deauville. They had one of the largest booths on the trade show, they were running constant demos of EclairPlay, several of the film, trailers and excerpts were mastered and projected in EclairColor (from the Barco RGB laser), prominent EclairColor posters were plastered everywhere and the EclairColor name was even around everyones’ necks on the conference badge lanyard. The FNCF Congres (to use its French name) is not just the largest national cinema convention in Europe, but it even exceeds CineEurope in terms of attendees with 2,700 delegates. The trade show is also almost as large, though lacking a Coca-Cola booth and instead having at its centre French audio-visual regulator CNC’s stand. It was here that CJ caught up with Jean Mizrahi on the second day. Wine and beer was being served at lunch time at the nearby booths of Ymagis and other companies, but we both stuck to bottled water (no Lunch With FT this) as we were both fighting off the cold that half the delegates seem to have caught. There were lots of topics to cover. Ymagis had just announced the 100th EclairColor installation, which also marked its entry into North America in partnership with Alamo Drafthouse, EclairPlay was rolling out in North America and the company was busy pivoting from a VPF-driven to a service-driven business model. But I began by congratulating Mizrahi on the cinemas that he personally acquired in Marseille last year. He laughed and said that they were a lot of work, but it is clear that being a cinema owner has given him additional insights into the business. I almost asked whether he attended the meeting of small French cinema owners the previous day, but knowing his busy schedule I doubt that he would have found time for that. “The Group [Eclair and CinemaNext] needs to get close to the needs of the exhibitors and distributors,” is how he characterises the driving principle of Ymagis. “It’s been my strong belief for many years that the end of VPF [virtual print fees] will lead to more content to cinemas.” Far from just being a segway for talking about EclairPlay, it is clear that Mizrahi has thought a lot about the future direction of cinema business. Ymagis was built on enabling the VPF-funded digitisation of cinemas in France and elsewhere, but having merged with dcinex, acquired the bankrupt Eclair and absorbed several European integrators, the company is in full scale pivot to content and services. “EclairPlay needs of course to help exhibitors get easier access to material for blockbusters,” he says, “but it is also targeting the films below the blockbuster level.” He notes that “many right holders won’t have money for marketing,” observing that this will be a ‘big change’. In the future, Mizrahi believes, “cinemas will be running marketing campaigns on behalf of content owners.” He modifies this by saying that all parties, “will play a role”, but this is clearly where he sees EclairPlay having a jukebox-like on-demand capability. It is no secret that EclairPlay is rolling out in North America first as a replacement of the CineConductor. It will not be deployed everywhere initially, but there are discussions for markets like Australia and 2018 will see it gradually rolled out across Europe. I had a demonstration of it the previous day, and the software (currently server-based but in the future moving to the cloud) has an intuitive and neat un-cluttered interface. As well as the films and all the information about them, the platform also delivers trailers, art-work, EPKs (electronic press kits) and more. Mizrahi modestly calls it a ‘first iteration’, but without being able to judge its stability in the field, it seems like a solid product. I challenge Jean that a product like EclairPlay is not really viable unless cinemas have a fat internet pipe. He conceded that there is a minimum bandwidth requirement, but says that their numbers from a indicates that “bandwidth is going up in every country. Even in Spain. It has improved dramatically.” Not just new releases but also older films could benefit for film festivals, retrospectives and museums. “The cost of trading back catalog films for example is very high – returns are low,” is how he sees it. This is true, but it is equally likely that people probably are also more favourably inclined when they see films in LightVibes, Dolby Cinema or Imax. Mizrahi admits that “it takes an effort to convince people” in the industry, but that they’ve had “good feedback” at the show. Asked what he thinks will constitute critical mass in any given territory he speculates that it probably around 100 screens. He also confirmed that Eclair has initiated contact with Fotokem, Deluxe and Technicolor about installing the EclairColor HDR grading capabilities in a Los Angeles-based post house. The last area that Ymagis has recently launched itself into is eSports, with EclairGame. The first cinema to be converted for this was Etoile Les Lilas in Paris which saw its auditorium 3 re-fitted with in-screens displays and controllers, in partnership with PlayStation topachat.com and Iiyama. 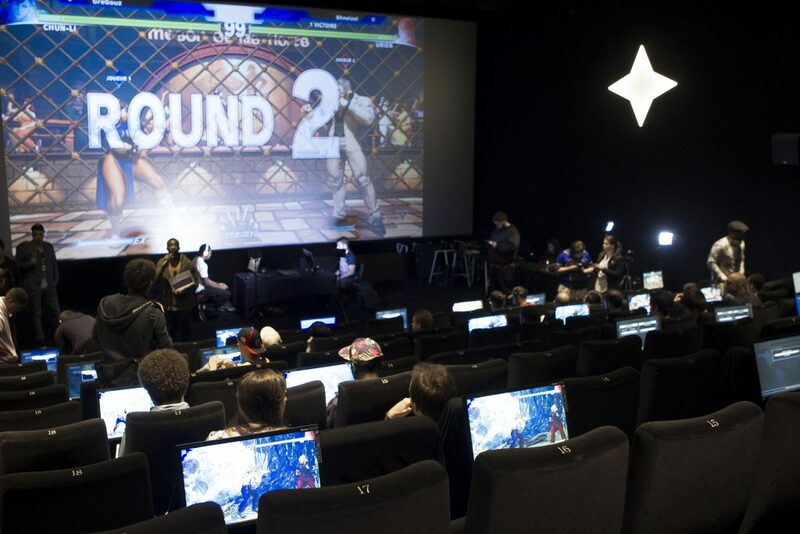 Ymagis promotional material says that “EclairGame has the will to build bridges between the tens of thousands of players and fans of competitive gaming – or eSports – and movie theaters.” Cine-Sessions will allow players to compete against each other in games such as Street Fighter V.
I suggest to him that eSports might be a more natural fit for cinema than VR lounges, but Mizrahi is not willing to dismiss the implication that it too could have for cinemas. “Cinema could be the ‘point-of-contact'” he says. “Or could become one with AR [augmented reality]. My feeling is it will come.” Asked a final question about EclairColor for the home market he waves it away, “Not really our business.” Ymagis and Mizrahi are squarely focused on cinema. And with that our time is up and he is off to his next engagement.